Can you believe the first season of Assembly Required is already over? It seems like just yesterday we were preparing for Assembly Required: Women in Leadership, and look how far we’ve come. We have loved each conference like it was our child, but those who have been attending since the beginning have said that this was the best one yet! 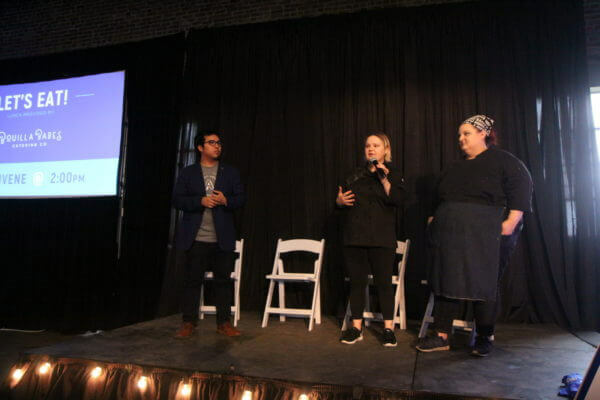 This mix of speakers, food, and networking proved particularly inspiring and we loved highlighting the best of the creative tech industry. If you’d like to see the photos from this event, go here. 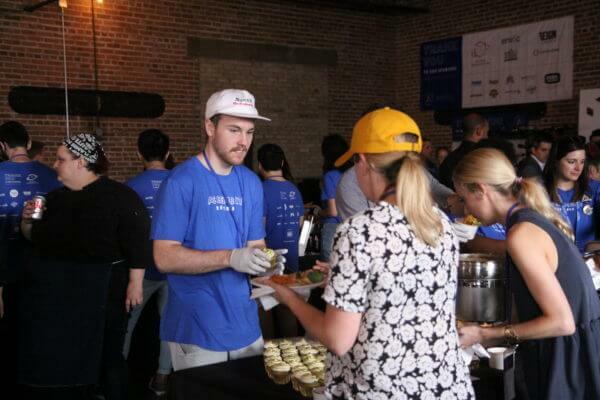 We kicked off this day-long event with fuel in the form of food, coffee, and convos as our attendees arrived and oriented themselves to our unique space. The nearly-finished event venue adjacent to the new ThreeSixtyEight office filled up with chatter as the coffee kicked in, and our sponsors and speakers nibbled on Whole Foods’ breakfast and coffee donated by Community and Uncle Ben’s Coffee alongside attendees. The event began in a cloud of smoke as host Kenny Nguyen hopped out of a DeLorean. With applause and a “Back to the Future” clip in the background, everyone in the room knew they were in store for an interesting day. Creative Venture Catalyst Chris Stapleton considers himself an inventor, one who works to solve problems that we don’t yet think are problems. He has worked in Broadway, mega theme parks, in hospitals and so many other places that the power of the imagination is unleashed. Stapleton began to describe the reality of the imagination as the true destination of technology, not Virtual Reality. “Virtual Reality is not a destination, it’s a bridge to the imagination.” This reality of imagination, stated Stapleton, is what will unlock potential in so many areas of life as we know it. Human inhabitation of Mars, better quality of life for the sick and elderly, and more are possible with VR as a pathway to the imagination: the reality that rules all realities. Increased participation in life – with your head, heart, and hands – is to be more human, and thus improve quality of life. Virtual Reality, Stapleton claimed, is the way to improved quality of life and greater human potential. See the whole talk here! “You’ll never get the talent to build a scalable tech startup in Louisiana.” That’s what investors told Chris Meaux when he began seeking out funding for a new app, Waitr. Despite the discouragement, the obstacles, and the “no’s”, Chris Meaux spoke to us on just that: scale. 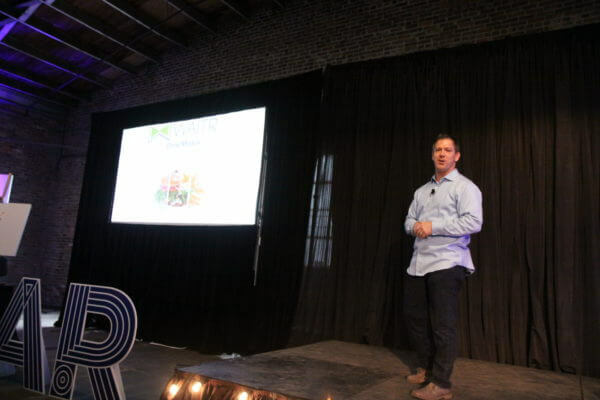 He then went on to show the audience how in it’s first year, Waitr – based in Lake Charles, Louisiana – had 57,000 orders and today, Waitr fulfills 75,000 orders per week. Since 2014, the “Chief Waitr,” as his employees fondly call him, has sought to answer the ever-pressing question “what’s for dinner?” After initial rejection, eventually came investors who believed that a technical startup based not in Silicon Valley or Austin, but Louisiana could thrive. Meaux walked us through his journey of finding technical co-founders, then-students at McNeese State University in Lake Charles, gaining investors who knew there was talent in Louisiana, and even scoring support from Drew Brees. Check out his full speech here! 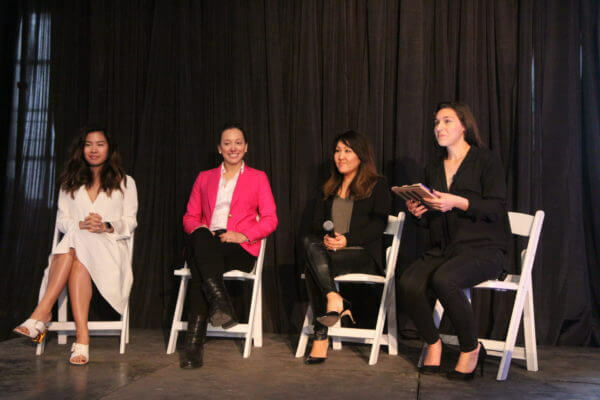 Our panel to discuss the future of marketing was stacked with individuals from a variety of industries which included Christina Troitino from Facebook, Cathy Novelli with Quantcast, Christine Ngo-Isaac with LVMH and Laura Foti of GE. With Troitino as the leader of the panel, this portion of the conference was like kicking back and discussing the industry with your friends (who also happen to be really wise and experienced). As our panelists began to talk about what marketing technologies they are excited about in their own industries, Cathy Novelli brought up a topic that resonated with everyone: data. The four agreed that often marketers are drowning in data and this often leads to what Laura referred to as “analysis paralysis.” Cathy Novelli questioned the practice of assigning heavier meaning to less consequential metrics saying “Are we measuring what is valuable or valuing what can be measured?” Christine offered that the solution – despite the industry – is to find a balance between qualitative and quantitative measurements. Christine Ngo-Isaac: Follow the leader, not the role. Laura Foti: Be cross-functional. Learn the fundamentals of a dicipline different from your own. Cathy Novelli: Use your 20’s to be a sponge, soaking up as much as you can. Use your 30’s to become an expert, and to harness your various expertise. Use your 40’s to be a mentor and give back. 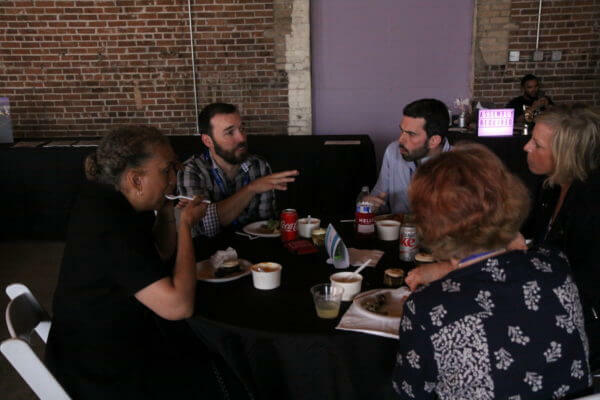 What’s more delicious than networking and lunch from Baton Rouge’s very own BouillaBabes? 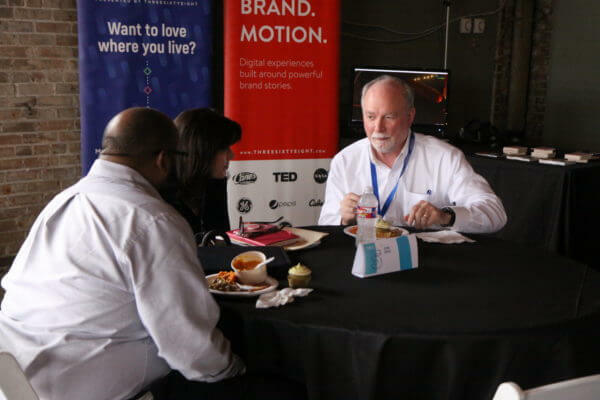 Many of our early bird attendees sat down with each of our speakers during lunch to get some personalized insight and share some laughs. Meanwhile, ThreeSixtyEight’s very own Jay Barros lead the audience in a fun, silly, and tech-themed game of trivia. Our friends formed teams and joined together to prove their knowledge. “What proof can you give me that creative ideas are better?” Seven years ago, Russell Fisher asked Adam Morgan this question that would change his career. At the time, Adam was a creative director at an ad agency and Fisher needed to bring evidence to his boss that creative ideas are worth it, without subjectivity or simply using a case study. Not a scientist by trade, Morgan dove into the field of neuroscience to explain this phenomenon. 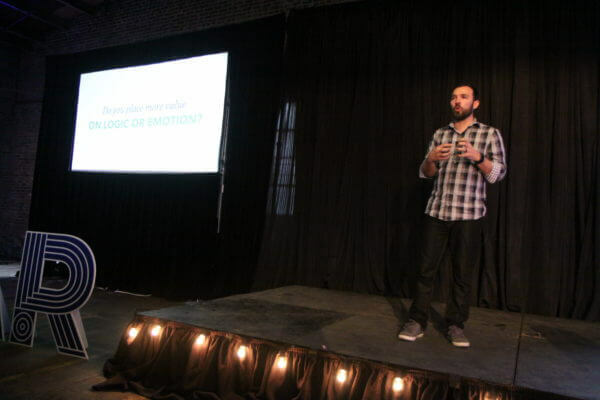 Creative ideas are emotional, Adam said, and our emotions – not just our ability to use logic – are what make us human. While historically “logic is king,” Morgan told us about a study of individuals who had lost the use of the emotional part of their brain, “they were rational people but had no emotion, they were unable to make decisions.” The scientist behind the study, Antonio Dimasio, concluded that “a brain that cannot feel, can’t make a decision.” Morgan went on to explain that our emotions are simply the reactions triggered by familiar situations and the decisions we’ve made in like scenarios. Hear the best of both halves of the brain in his full talk. Next we heard from Martin Roth, the Leader of Revenue at zlein, a SaaS company that helps to manage payment processes in the construction industry. SaaS, Roth explained, is “Software as a Service” and a distribution method for technology. 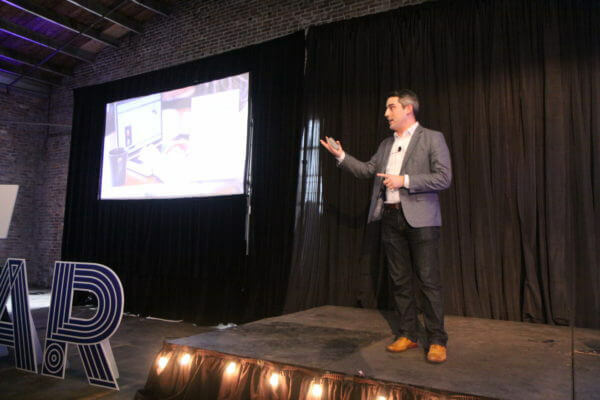 The first thing Martin showed to us was a slide with two pricing options for the same software widget: one was a one-time payment of $200 and the second was a $20 per month charge for 12 months. He began to explain why so many companies – and consumers – are opting for the second choice. Recurring revenue is huge right now, Roth explained, and so many industries are finding ways to provide value on a monthly basis. Martin told us about Marc Andreesen, the founder of Netscape, who predicted a trend that would permeate across industries: “software is eating the world.” This theory stated that software-enabled companies would attain success due to their economies of scale and their varied revenue drivers. He went on to explain the revenue multiple and showed the revenue multiples for Apple, Salesforce, and Netflix. While Apple’s multiple is 2.5x, Netflix’s is 10.9x. This is because there’s more profit and scale potential, and lower fixed cost in the recurring revenue model and in the SaaS business model. Roth’s company, zlein, found a way to incur recurring revenue and he let us know that the next step is to decrease friction for the customer for buying your product. He gave us a few words from The Lean Startup: “Surprisingly few companies take the basic step of attempting to learn about their customers.” Roth went on to tell us about how zlein learned what other types of software needs and other problems the existing customers of zlein had, and then went after developing those solutions. The payoff? In an accessible and brief study of unit economics, Martin showed us how the success of first year of recurring revenue relative to CAC (customer acquisition cost). While there are so many KPIs that can be taken in this business model, Martin directed us to look to customer’s lifetime spending, and how long the customer sticks around. Watch the whole thing here! How do we attract and keep top talent in Louisiana? John Jones – Senior VP of Public Policy and Government Relations at CenturyLink – cracked open this topic for us. CenturyLink is a Fortune 500 telecommunications company based in Monroe, Louisiana and employs developers, engineers, creatives and more from across the country and often people wonder how they have achieved the talent in a state like Louisiana. Jones started his career at CenturyLink by chasing a new need they had, as a graphic specialist in corporate communications. As the needs of the company change, their recruitment of certain roles changes and what was once a small team of IT people or engineers is now a few thousand of each. 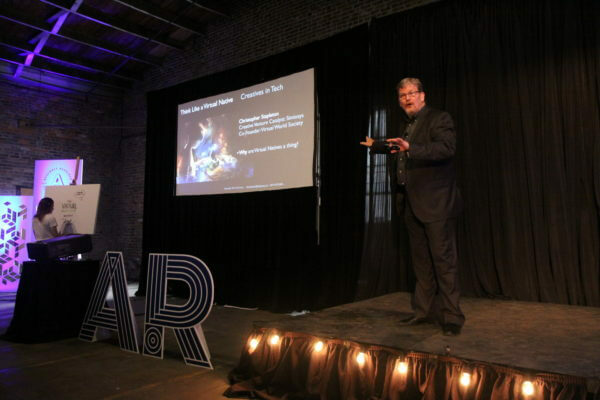 Currently, CenturyLink is aiming to transition to a fully digital costumer experience. CenturyLink has joined with its community in the “i-20 quarter” to make Louisiana an attractive place to potential employees and unique to northwest Louisiana. From fighting for better schools and lower crime rates to plating trees in Monroe, CenturyLink makes its area a more attractive place to be for the talent they hope to recruit and maintain. CenturyLink shows new recruits what’s great about Louisiana and even has to address issues like negative stereotypes. As Franz explains, “John sees Louisiana as a frontier” with potential for retaining employees and increasing opportunities for the employees there. “Who here is afraid of spiders? 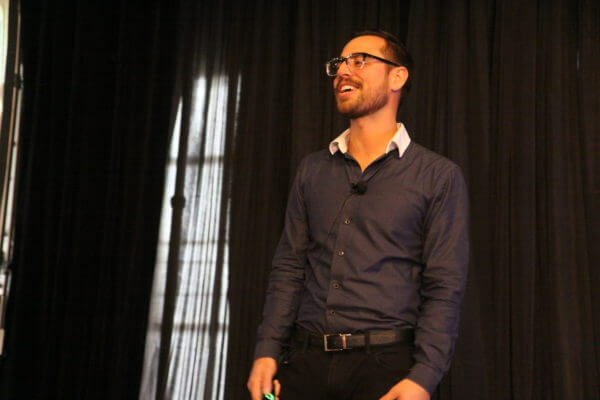 What about snakes?” Sam Tarantino asked his audience at the outset of his keynote. These are natural fears, Sam told us, and fear is an evolutionary mechanism that helps us to survive. Sam was there to talk to us about fear because it’s an important part of entrepreneurship. He informed us that he didn’t have a special expertise, “I just have a lot of experience getting hit in the face with a baseball bat.” Tarantino gave a humble and honest testimony of his experience with fear and failure, and overcoming it. Tarantino met his business partner Josh in 2006, before the iPhone and when Myspace was the largest site on the internet. This is the world in which Sam and Josh founded Grooveshark in their college town of Gainesville, FL and grew it to 35 million users, 120 employees and $60 million in revenue. They attracted talent from around the country to Gainesville – “you can bring people to an area if the mission is compelling” – and the investment dollars to grow the company. The company was growing by 500,000 users every month and Sam and Josh were recognized in Forbes 30 Under 30 for 3 years running. Even in less favorable economic times, Grooveshark continued to grow and succeed. This was when Tarantino came face to face with fear itself. Sam began to speak on the 5 lawsuits, the shutting down of his company, and the death of his best friend. The room went silent as we felt Sam’s world come crashing down through his words. Tarantino clicked a photo onto the screen: one of the Wright brothers’ flight, one of the most famous photos. Then Sam showed us the photos you don’t see: the crashes and the broken planes. Orville Wright actually killed one of the men from whom he was supposed to gain a military contract during a flight. “Courage is a choice,” Sam told us, and the Wright brothers kept going due to their love of innovation in flight. Watch his full keynote here! What a day! It wouldn’t be 5pm on Friday in Louisiana without happy hour. We toasted to an incredible day with tastes from Caneland Distilling and Tin Roof’s own Voodoo IPA. We played games and celebrated the day alongside a variety of professionals, our vendors and sponsors, and speakers. Additionally, we enjoyed such delicious tacos, hors d’oeuvres, and more from Sammy’s Grill. Thanks so much for joining us for the Assembly Required journey. We’re so excited for everything that the future holds for our friends and would love to hear how Assembly Required has inspired you. Alex is ThreeSixtyEight's marketing intern and provides support in the form of social, copy, brainstorming, and bad jokes. She enjoys traveling, 80s music, and pretending to know a lot about craft beer. It's all fun and games until someone tells her that Latin is a dead language. 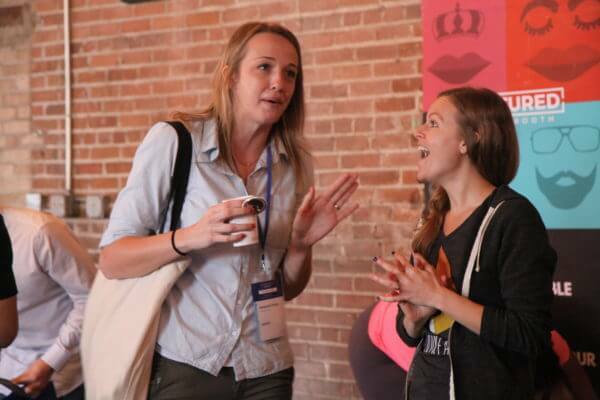 ICYMI: Assembly Required: Creatives in Tech was flippin great. Subscribe for updates. No spam, just free stuff. Our new conference series, Assembly Required, is in full swing. Tickets for innovators in Food are available now.